For a week in early August (8/6/12 - 8/10/12), I worked closely with Ronald "Chip" Fenenga of Santa Ynez Valley Union High School (SYVUHS) to train him in CyArk's digital preservation methods and standards. After acquiring grants for new skill-based equipment and software, SYVUHS approached us about becoming one of our partnering Technology Centers (see Related Articles below for more about other TCs). CyArk was thrilled! We've been working with universities across the globe to create Technology Center partners where we help train staff and researchers in our methods so that they can propagate these skill sets further in a local capacity. Santa Ynez was going to set a new standard however as our first ever high school partner. Chip Fenenga is a science teacher at SYVUHS and runs the Environmental and Spatial Technologies (EAST) classes. 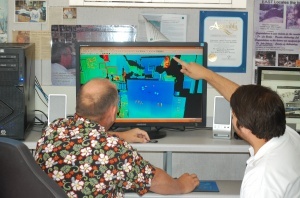 The EAST initiative provides technology training to students through student-driven service projects, including hardware and software for 3D modeling, GPS/GIS mapping, and Computer Aided Design (CAD). The adoption and inclusion of 3D Reality Capture technology seemed the next best step to him and his administration to keep SYVUHS students at the forefront of spatial technologies. To kick-off the partnership and get Chip and SYVUHS up to speed, I traveled south from my base in the San Francisco Bay Area to the historic region of coastal California that is Santa Ynez and its many small, neighboring communities (such as Solvang and Los Olivos). Over five intensive days, Chip became a digital preservation expert just a week before classes were scheduled to start and he'd be teaching digital preservation to students. I believe the appropriate idiom is "Baptism by fire!" SYVUHS joined our ranks of Tech Centers by purchasing a Faro Focus3D scanner, panoramic imaging equipment and software, and point cloud data processing software (including Leica's Cyclone and Bentley's Pointools). SYVUHS is looking to provide some of the best hands-on, practical experience in the latest 3D data capture technologies for its students. CyArk and SYVUHS also hope to collaborate closely on historic sites near the campus, including the Santa Ines Mission as part of our larger El Camino Real project. We are excited to partner with SYVUHS and work closely together over the coming years to make digital preservation more accessible to learning youth. Congrats to SYVUHS on their spectacular forward thinking and action! 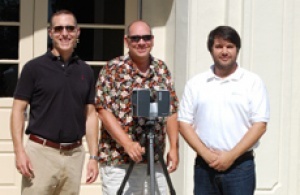 Superintendent Paul Turnbull, Chip Fenenga, and Justin Barton pose with SYVUHS' newest technical wonder: a Faro Focus3D laser scanner. Chip Fenenga learns about data processing in Leica's Cyclone while Justin Barton teaches him the tricks. 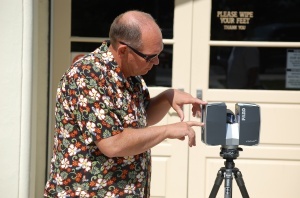 Chip Fenenga gets hands-on practice scanning some of the campus buildings.